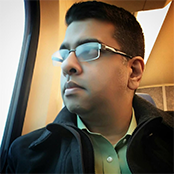 A seasoned UX leader with 18 years of industry experience, Atul has a Master’s in Information Technology and is also a certified UX designer and researcher. His greatest strengths are in product strategy and UX best practices and methods within an agile world. Atul is a big advocate for the application of design-thinking methods to both organizational change and product design and development. He applies his expertise to help organizations bridge business goals and user aspirations, translating complex business ideas into actionable blueprints for Web and mobile products in a variety of domains. Beyond the corporate world, Atul enjoys spending time with his frisky, four-year-old son. When time allows, he likes to get creative with his woodworking skills in his garage. Connect with Atul on LinkedIn.